Files are made for sharing! 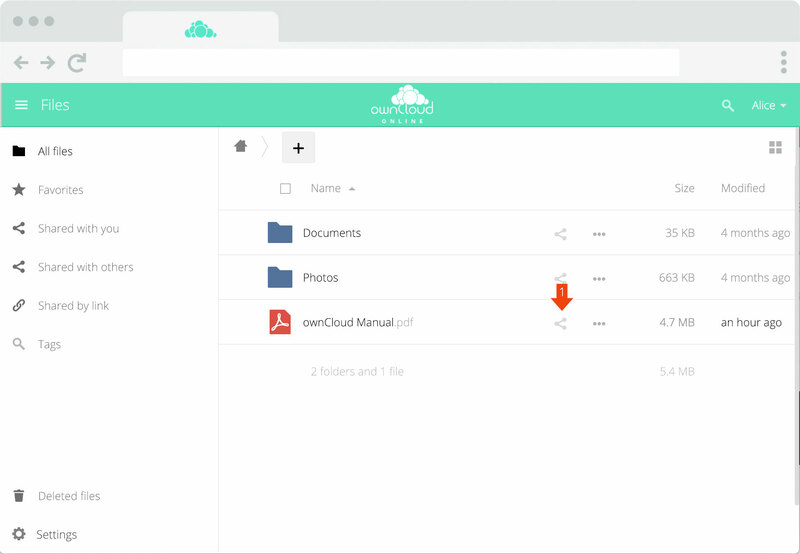 With ownCloud Online sharing files becomes easy, fast and secure. Explore the possibilities how to secure and speed up your daily routines. Alice wants to share a file with a co-worker and clicks on the sharing Icon (1). In the sharing menu on the right Alice enters the name of her colleague (2). She clicks on the username she wants to share the file with (3). Public links (4) are explained in the section below. The Share is now created (4). Alice can specify additional file editing settings for Bob. Clicking the trash bin removes the file for Bob again. To see an overview of all shared files Alice clicks on „Shared with others“ (5). Based on Bob’s notification settings (default: once an hour) a notification mail is sent informing him, that Alice shared a file. After logging in Bob sees now the shared file in his file explorer (5). Note the name next to the sharing icon indicating that Alice shared this file with him. To get a list of all files shard with him Bob clicks on „Shared with you“ (6). 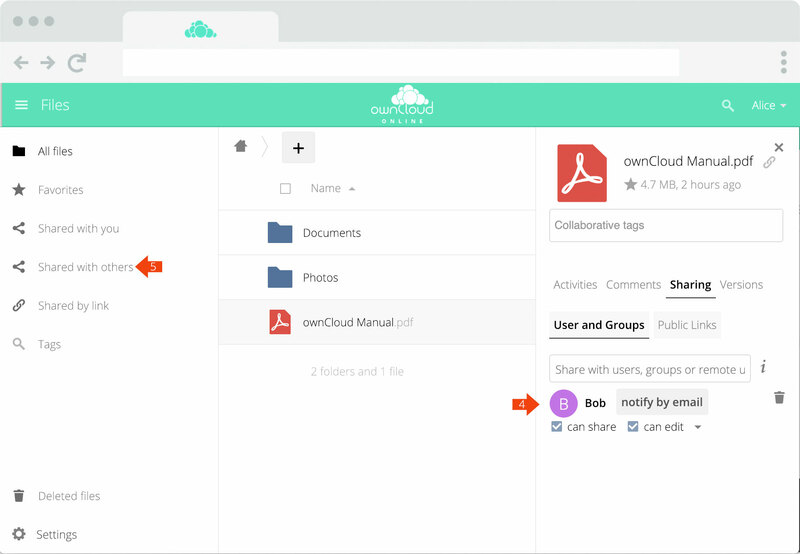 This steps covered the basics of sharing files with ownCloud Online. See the Pro-Options for sharing in the following sections. Want to share files with external people? With guest accounts you easily include people from outside your company into your workflow. Public Links can be used to share files and folders to people who don’t have a user account. This is perfect for one time shares and for people who should only get access to specific files and folders. Everyone who gets the share link can see the shared files immediately. No User or Guest Account is needed. 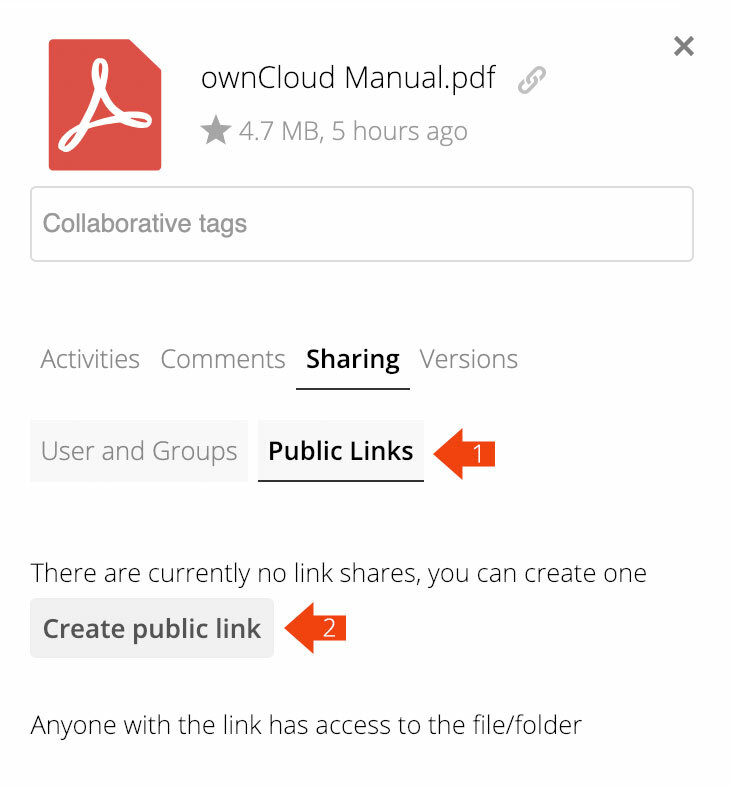 To create a public share link click on the button (2) in the sharing menus „Public links“ section (1). Download / View / Upload / Upload only: Set the access levels to the file/folder you want to share. Password: Set a password to protect the share. Expiration: Set a date where the share link expires. Send link via email: Enter one or more email addresses to automatically send the created share link to recipients. Sometimes you don’t want to share but receive files from other people. Often sent via email or „I’m quickly uploading it to xytransfer.com“ is it neither secure nor very efficient and bargains a lot of sources of mistakes. 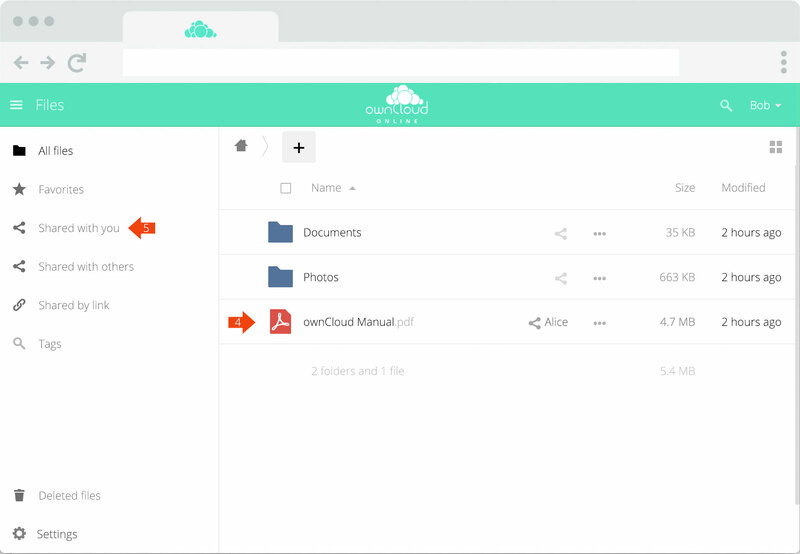 ownCloud’s FileDrop feature offers a simple and lightweight solution for this. Imagine a digital PO Box where people can just drop their files. 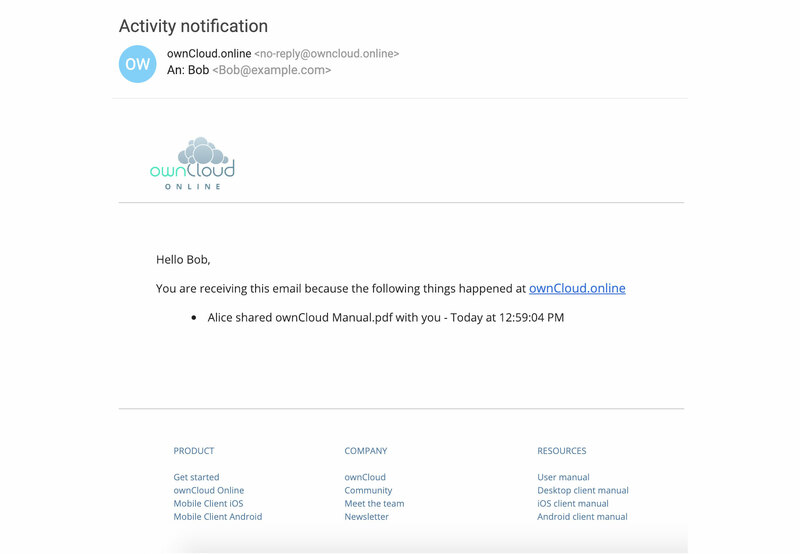 The upload is secured by ownCloud.online’s security measures and files are safely stored in your cloud. To create a FileDrop link just enable „Upload only“ in the public links settings. Set editing permissions to files and folders. Lets the user create new, change and/or delete files and folders. Note that on shared files only „can edit“ is available which is a write permission. In addition to the notification emails sent by the system you can notify users about a share. While system notifications are sent based on the users settings (default: once an hour) this notifications is sent immediately. Remove the share and stop the access to that file or folder for the specified person. Enter a name for this public link. This gets displayed when opening the link. Set permission to only view and download files but disable uploads (read permission). Set permission to view, download and upload files (read and write permission). Set a password protection to the public link. Users who want to access your public link will require this password. Set an expiration date for a public link. After the selected date accessing files/folders via this public link will be automatically disabled. Automatically send the link after creation to an email address. Separate multiple email addresses with a semicolon (;). 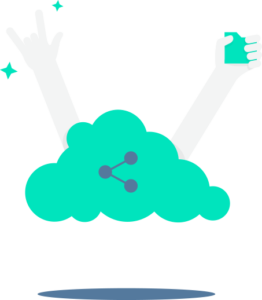 Get notified in realtime about file actions and see who worked on your files. No file action will get past you anymore.